The following memorial tribute was contributed by Capt. Ken Kahn. I had my first trip with Capt. 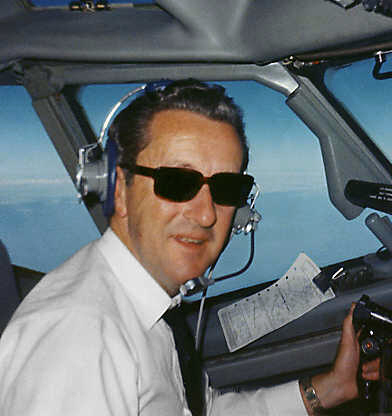 Bob Henry when I was a very green copilot. As we were sitting in the cockpit doing our checks, he turned to me and said, "I want to tell you something." I turned toward him, dreading that I had already screwed up, before we had even read the checklist. I asked, "What is it?" and he replied, "I don't run a hard-assed trip." He explained that if I thought he had made a mistake, I should tell him, and he wouldn't be angry at me even if I was wrong. He said that if I made a mistake, he would tell me, and he didn't want me to be upset. He explained that it was his intention to run a safe, pleasant, low-key trip. And so he did. I resolved then and there to remember his example when my opportunity came to be captain, and I did even though it took many years. Bob suffered from a phobia of check rides, and lived in constant anxiety about the next one, even though he was a competent, professional pilot. I think it was because of that anxiety, that he was unusually kind to, and patient with, his crewmembers; especially if he thought they might be struggling. His thoughtfulness did not end in the cockpit. When we got to the hotel, he always made certain that there was a room for everyone before he went to his. Bob once told me that he had been a B-29 instructor during the war, and that he got every one of his students through training. Any instructor can flunk a struggling student, but it takes teaching ability and the willingness to make the extra effort to help such students get through. Capt. Bob Henry had both.